Bring to mind something that you’ve committed to regarding your business or work, and then haven’t fulfilled on. Take a moment to think of something specific. Ok, now why didn’t you fulfill on that? What had you not come through? Sorry, that was a setup. See, in the world of outcome-based thinking, the world of having a high regard for what one commits to, whatever answer you came up with is somewhat irrelevant. Once you’ve committed to doing or producing something, it either gets done or it doesn’t. That’s all that matters in the end. Your reasons, your explanations, your justifications may serve as a compelling story, but they are not the result. It’s easy to forget that. Sometimes it seems like “failing + a good excuse = succeeding”. That math is wrong—but it sure is appealing! There comes a sense of gratification, of relief, when we explain away our failures and/or mistakes; unfortunately, that’s all we get. Get yourself clear that, once you’ve committed yourself and the time has come to deliver, you either have the results or you have your reasons why you don’t. There’s no grey area. Worse yet, our explanations often obscure the true source of our ineffectiveness; they leave us, as they say, barking up the wrong tree. So, not only are we attempting to mask our lack of results with (usually) a well-crafted story, but when we cling to the comfort of our reasonable explanations (see: excuses), we blind ourselves to some other perspective that would make a difference in altering our performance. This is the nature of explanation and reasons: they fail to replace actual results and they inhibit us from learning and growing and being effective going forward. Bring that area to mind again, and your reasons for not fulfilling. What if those reasons aren’t “The Truth”, but only a possible perspective? What other explanations could you come up with? Are any of those making a difference? Now, what if you simply let go of your excuses, and owned what happened—and more relevantly, what didn’t happen? If you were to take the view that simply, “I didn’t do what it took to produce the result”, and then you took it on like you actually have a say in the matter of how it turns out, like you actually have some power to make a difference, what would become available? 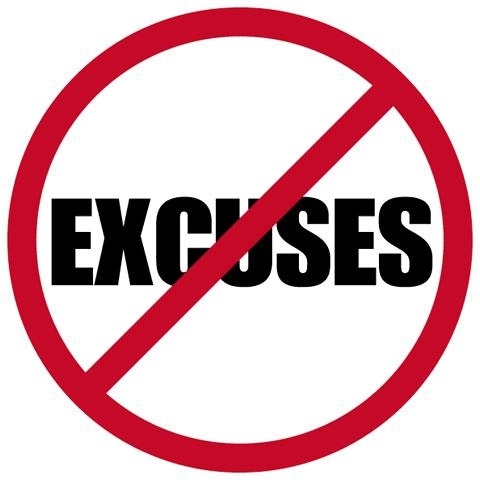 Drop your excuses. Set your explanations aside and bring some fresh eyes to the issue. See what could be done if you weren’t satisfied with your reasons. Contact me at paul@alsleadership.com, so that we can set up a 60-minute conversation that will have a real impact in your ability to fulfill on what you’re committed to in that area. No charge of course, and I promise that it will be well worth your time.